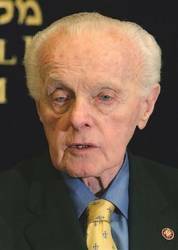 Democratic Congressman Tom Lantos, chairman of the House Foreign Affairs Committee, the only Holocaust survivor to serve in Congress and one of Israel’s staunchest advocates in Washington, died Monday at the age of 80. The death of the widely respected congressman prompted numerous tributes across the American political spectrum and from Jewish organizations and Israeli officials. Though Lantos supported the peace process, he insisted it not be done in a manner that endangered Israel’s security. He proudly advertised the fact that he visited here no less than 68 times, and in his final visit last August he told The Jerusalem Post with typical bluntness that Israel should not be pressured to remove roadblocks in the territories. Lantos disclosed last month that he had been diagnosed with cancer of the esophagus. He said at the time that he would serve out his 14th term but would not seek re-election in his northern California district, which includes part of San Francisco. The timing of the diagnosis was a particular blow because Lantos had assumed his committee chairmanship just a year earlier, when Democrats retook control of Congress. He said then that in a sense, his whole life had been a preparation for the job – and it was. Lantos, who referred to himself as ”an American by choice,” was born to Jewish parents in Budapest, Hungary, and was 16 when Adolf Hitler occupied Hungary in 1944. His mother and much of his family perished in the Holocaust. He survived by escaping twice from a forced labor camp and being taken under the protection of Raoul Wallenberg, the Swedish diplomat who used his official status and visa-issuing powers to save thousands of Hungarian Jews. Among his first acts in Congress was helping to secure honorary American citizenship for Wallenberg, who went missing in Soviet captivity after the war. Lantos immigrated to the US in 1947. After earning a doctorate in economics from the University of California at Berkeley, he spent three decades teaching economics at San Francisco State University, working as a business consultant and serving as a foreign policy commentator on television. He challenged a Republican incumbent in 1980 after other Democrats passed up the chance to run, and won narrowly with 46 percent of the vote. Lantos founded the Congressional Human Rights Caucus in 1983. His Holocaust background gave Lantos a moral authority unique in Congress, and he used it repeatedly to speak out on foreign policy issues, sometimes courting controversy. In 2006, Lantos was one of five members of Congress arrested in a protest outside the Sudanese Embassy over the genocide in Darfur. In October 2007, as Foreign Affairs chairman, he defied Bush administration opposition by moving through his committee a measure that would recognize the World War I-era killings of Armenians as a genocide, something strongly opposed by Turkey. Lantos was a lead advocate for the 2002 Congressional resolution authorizing the Iraq war, although he would come to be a strong critic of the Bush administration’s strategy. He spoke out strongly against the failure of Egypt to stop arms smuggling across the Sinai border to Hamas and of Lebanon to halt the flow of Syrian weapons to Hizbullah, and advocated that US aid to Cairo and Beirut be tied to the issue. Although such stands, along with his unstinting support of Israel, earned Lantos attacks from the far-left wing of the Democratic Party based in his own San Francisco Bay-area district, he was always re-elected by comfortable margins. Lantos defined himself as a secular Jew, and his Hungarian-born wife, Annette, who survives him with two daughters, became a member of the Mormon church. But throughout his career, Lantos championed Jewish causes, including playing an important role in the campaign for Soviet Jewry and helping to establish the US Holocaust Museum. On Lantos’s passing, Jewish Agency Chairman Ze’ev Bielski said Lantos deserved recognition for his role in the campaign to release funds for Holocaust survivors, as well as his current bill in Congress on the issue of outstanding Holocaust-era insurance claims. Bielski also noted the unique role that Lantos played in fighting anti-Israel rhetoric at the Durban Conference in 2001. Tall and dignified, Lantos never lost the accent of his native Hungary, but his courtly demeanor belied the cutting comments he would make in committee if the testimony he heard was not to his liking. ”Morally, you are pygmies,” he berated top executives of Yahoo Inc. at a hearing he called in November 2007 as they defended their company’s involvement in the jailing of a Chinese journalist. ”This is about as believable as Elvis being seen in a K-Mart,” was his retort to a witness testifying before a subcommittee he headed in 1989 that led a congressional investigation of Reagan-era scandals at the Department of Housing and Urban Development. Lantos was a frequent visitor to Hungary, meeting with political leaders and holding recurrent news conferences which were widely covered in the Hungarian press. He was widely recognized there for his calls to respect the human rights of the millions of ethnic Hungarians living in neighboring countries, especially Romania and Slovakia, whose cultural identity was a common target of those countries’ communist regimes.